The 33-year-old, who plays pregnant prisoner Dayanara Diaz on her popular Netflix series, appeared in Manhattan Criminal Court on Thursday. 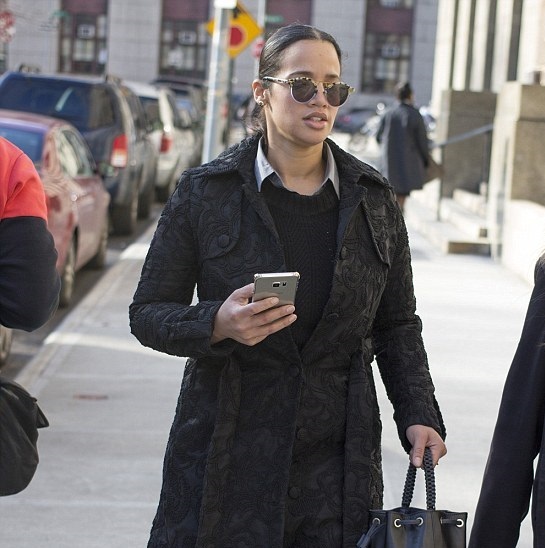 The actress faced four counts of assault and harassment following her arrest this past summer at her Washington Heights home on July 29 after allegedly attacking 17-year-old Michelle Cardona. Polanco is accused of punching, scratching and pulling the hair of the girl. Cardona has alleged that Ms Polanco assaulted her at the teen's Upper Manhattan home on July 29, 'the defendant strike Ms. Cardona in the face and head with a closed fist at least three times, pull Ms. Cardona’s hair, and strike Ms. Cardona’s arms with the defendant’s hands and nails,' according to court papers obtained by Page Six. While Polanco's defense attorney Gerald Lefcourt claimed in a statement: 'It’s a setup to try to get money and it was tape-recorded. ''This young woman was trying to extort her to drop the case. We’re confident the charges will be dismissed,' Lefcourt added. The actress was released without bail and was ordered by a judge to steer clear of Cardona. Polanco is next scheduled to be in court in January.